Thanks to Riitta Liisa Myllymàki for supplying the photograph. KlausJärvinen from Finland, Kevin Friedrich from New Zealand, Tiit Kalluste from Estonia, Pavel Fenjuk from Ukraina, Mika Väyrynen from Finland and Richard Galliano (president) from France had a very very difficult choice to make in order to decide which are the 2 finalists to play for the first title of the Primus Ikaalinen...some of the competitors dressed in their traditional dresses like Paul Chamberlain from Scottland with his kilt and Petra from Switzerland with her "Dirndl". Vladimir Zubitsky's "Hommage a Astor Piazzolla"
Idoia Laburu (Student of Joxdn Goikoetxed) from Spain playing "Fou rire" by Richard Galliano. Both were passionate and both expressively performing on stage! and the winner is: IDOIA LABURU FROM SPAIN Congratulations Idoia! -Bravissima!!! Basque music is very interesting and Laburu plays it for us in the competition. Meeting place for accordionists and the public. 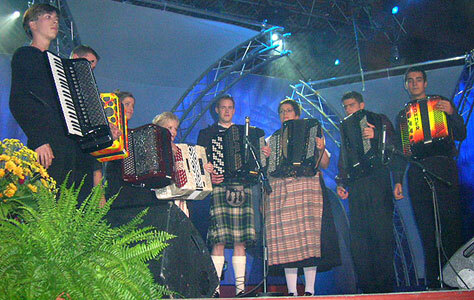 International Accordion Competition. Participants from Spain, France, Switzerland, Italy, Finland, Ukraine, Serbia and Russia. 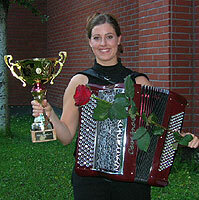 International Accordion Competition. Participants from all over Europe. A dance night. Light music by Matti Lepänhaara, Seppo Soittila and Ruorimiehet. An hour long cruise with the m/s Lempi. Music by Tiina Pitkänen and Seppo Lankinen. 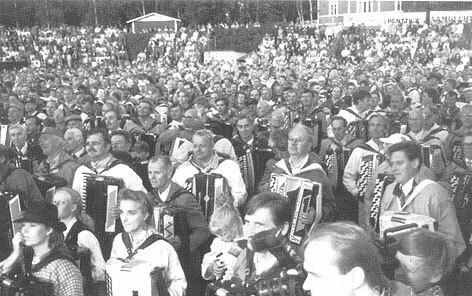 The performing groups are Remu & Hurriganes, Veli-Matti Järvenpää & Co and the Bryac-band from Ukraine.